The primary concern of parents is the safety of their children while traveling. A close second is keeping them quiet.. Traveling by air can offer its own unique concerns since the parent is not in the driver’s seat. 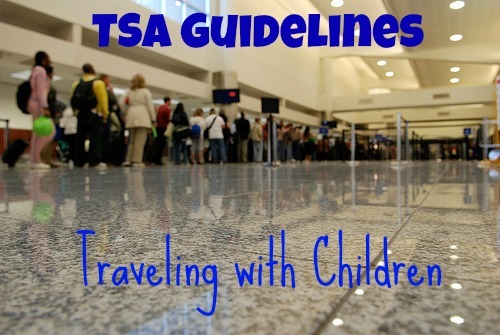 We travel quiet a bit so if you plan on taking an excursion by air with your little ones, here are some guidelines offered by the Transportation Security Administration (TSA). The easiest way to travel – whether by air, bus, train or car – is to know the rules and regulations before you plan your trip. Standing in the airport is not the time to familiarize yourself with them. Save yourself and your kids a lot of trouble and stress by being prepared. Read on to find out most of what you need to know. Heightened security measures have led to longer lines in the airport. UGH! It is a good idea to arrive at least two hours before your scheduled time of departure. This allows enough time to pass the security screening and make it to your gate at a comfortable pace without worrying about long lines. Bring games to keep the kids busy. Children are required to undergo the safety checkpoints. For children under 12 years, the requirement to remove shoes is waived. They can keep them on. Parents are allowed to stay with their children as they pass through all security areas. Wands can be employed if needed. And, TSA officers will be patient with kids who are agitated by security. Traveling with children can require a lot of extra carry-on baggage. This includes child safety seats (aircraft approved of course), toys, blankets and strollers. All of these items need to be loaded on the conveyer belt for inspection. Any items that can’t pass through the machine can also be visually inspected by the officers. Babies can be carried by their parents through the metal detector. They are not allowed to stay in their baby seats. Boo! Additionally, infant formula, breast milk and baby food are not subject to the three-ounce rule for liquids. The bottles will have to be visually inspected before you board the plane, however. Disabilities should not prevent your child from being able to travel by air. In preparation for that, the TSA has guidelines specifically for these children. To be sure that the security checks run smoothly, inform your airline that you will be traveling with a child that has need of additional appliances (wheelchair, motorized scooter, braces, etc.). Your child will not be asked to leave their wheelchair, but will be patted down (in your presence) while seated. For instances when there is one parent with a disabled child, ask a safety officer to help you with your carry-on baggage to facilitate quicker movement through the security checkpoint. This should help you a ton! When traveling with children, know the facts before you travel. Talk to your kids to prepare them for the security checkpoints. This will make things go so much quicker and easier! Where do you want to go?